The maths, the formulas, and the problems associated with corporate finance can be daunting to the uninitiated, but help is at hand. 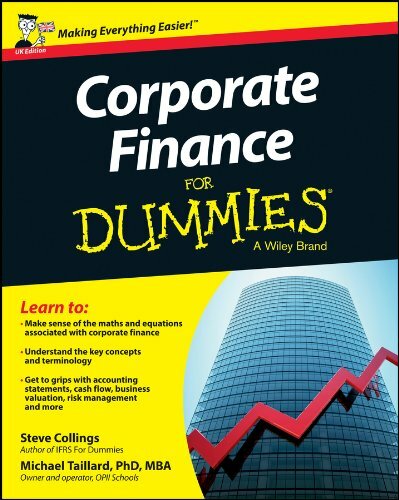 Corporate Finance For Dummies, UK Edition covers all the basics of corporate finance, including: accounting statements; cash flow; raising and managing capital; choosing investments; managing risk; determining dividends; mergers and acquisitions; and valuation. It also serves as an excellent resource to supplement corporate finance coursework and as a primer for exams. Inside you'll discover: The tools and expert advice you need to understand corporate finance principles and strategies Introductions to the practices of determining an operating budget, calculating future cash flow, and scenario analysis - in plain English Information on the risks and rewards associated with corporate finance and lending Easy-to-understand explanations and examples Help to pass your corporate finance exam! Steve Collings is Audit and Technical Director for Leavitt Walmsley Associates Ltd. Steve is a regular contributor to AccountingWEB.co.uk and is the author of IFRS For Dummies and the UK edition of Financial Accounting For Dummies. In 2011, Steve was named Accounting Technician of the Year at the British Accountancy Awards. Michael Taillard, PhD, MBA, owns and operates OPII Schools, an award-winning national private school and tutoring company designed as a philanthropic experiment in macroeconomic cash flows as a form of urban renewal.